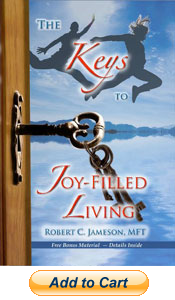 For more than 20 years, Robert Jameson has been sharing the concepts presented in The Keys to Joy-Filled Living with his clients. It is now time to share these Keys to a wider audience. Robert Jameson has the ability to share with you The Keys to creating a life filled with joy, peace, love and abundance. 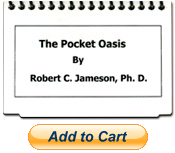 In a gentle and spiritual approach, Robert C. Jameson, MFT, presents simple and powerful techniques that are intended to be used regularly to achieve joy in everyday life. You will learn how to truly love yourself and have a healthy, functioning, long-term relationship that makes your heart sing through time. He uses his experience of over twenty years as a Marriage, Family Therapist to explain, in simplified language, how to approach your fears head on, how to transform events from the past into stepping stones, how to change your negative self-talk, how to express your “negative” emotions so you don’t hurt yourself or others, and much more. “Healing Affirmations & Positive Self-Talk” offers sixty-minutes of healing affirmations and positive self-talk designed to reprogram your conscious and subconscious mind from negative critical thinking to positive, nurturing and expansive thoughts. Listen as you drift to sleep, while doing daily chores, or whenever you have a few extra minutes from your hectic day. 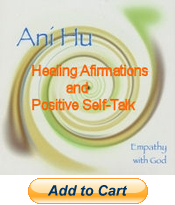 Enjoy listening to “Healing Affirmations & Positive Self-Talk,” in its entirety or in small bits. There is no right or wrong way to use this CD. Just listen and enjoy the process. Also great for parents to play while their little ones nap and sleep. 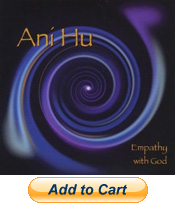 The gentle, and relaxing musical underscore is from Mr. Jameson’s soothing “Ani Hu – Empathy with God” CD. “Ani” and “Hu” are two ancient Sanskrit words. “Ani” suggests empathy, and “Hu” is a word for God, thus the title of this extraordinary musical beauty. Robert Jameson developed this gentle, soothing and relaxing music unique in every sense of the word. Perfect for complete relaxation, meditation, yoga classes, massage studios, surgeon’s, esthetician’s and therapist’s offices, convalescent homes, hospice facilities, birthing rooms, background music for writers and deserving corporations. But most importantly for creating utmost peace at home or while taking a candle light bath. Do you ever feel stressed out and over whelmed? Do you have too much to do and not enough time to breathe? Do you feel your life is passing you by? Then the Pocket Oasis is for you. Carry this little book in your pocket or purse. In moments of total over whelm, pull it out and read the words silently or out loud. Ahh! A breathe of fresh air. A moment to just “be” is present. You can have fun randomly opening The Pocket Oasis and meditating upon one word for the day. Many say it’s a wonderful tool to help hold a positive focus. All Product Purchases Are Protected By My 100% Satisfaction Guarantee! I want you to be 100% satisfied with your purchase of my products. If you are not totally satisfied with your purchase and do not feel that it was worth everything you paid, simply ship it back to me and I will refund the entire purchase price, less shipping and handling.